For the playable demo of Dragon Quest Heroes, I went in expecting just another Warriors-style game with a Dragon Quest skin over it. What I got was much more. And it&apos;s called Dragon Quest Heroes. It looks like Dragon Quest meets Dynasty Warriors. During this past weekend in Japan, the annual Jump Festa was held, during which – among other things – Square Enix revealed a playable demo for its upcoming hack-and-slash game. Being developed by Tecmo Koei's Warriors game series team, Omega-force, I pretty much figured the game would be a Dynasty Warriors game spin-off much in the vein of One Piece Pirate Warriors, Dynasty Warriors: Gundam, Fist of the North Star: Ken's Rage, or the more recent, Hyrule Warriors. You know; same basic working formula, different face. I ended up leaving the booth genuinely excited for the game. First off, I should clarify that, yes, Dragon Quest Heroes is very much a Warriors-style game: You control a character and run through fields mowing down numerous enemies. It's a power fantasy formula that reliably sells, and that's all the developers would have to do to make a game that fans would buy. However, someone up top was obviously not content with the status quo and the development team have brought their A-game in terms of adding and mixing various elements to make a new and engaging experience. First, off, you're not a lone Übermensch against an army of thousands. Dragon Quest is an RPG where you go on adventures with other characters in a party, so for Dragon Quest Heroes, you have four characters fighting together. Each character has their own unique skills and you can cycle between characters at any time. In the party I had, one character had a debuff attack to lower an enemy's defense, so I would use his special attack and then switch out to a stronger character to maximize the damage. The special skills varied nicely and from the short time I had with the demo, I could tell that there were obviously situations where it would be more advantageous for certain characters over others. While you only use 1 character at a time, the other three party members will fight of their own accord, so while they are obviously more effective with a player behind the wheel, they're not exactly useless sacks on their own. The battles felt more chaotic and real switching from character to character while they were each engaged in their own fights. The Jump Festa demo offered two modes of play: One where you fought in a general field (the easy mode) and one where you fought against a boss character (the hard mode). I chose the hard mode and I was pitted against a giant Cyclops (the one seen in the first trailer). While this isn't the first time that giant enemies have appeared in a Warriors game, for Dragon Quest Heroes, they added some new elements into the mix. The stage I fought the Cyclops, Gigantis, in was a progressive map. Gigantis slowly lumbered forward through a city towards an objective and it was obvious that my goal was to stop him. As he made his way through the city, every now and then there would be a cutscene of Gigantis smashing through a gate, indicating his progression. He also wasn't alone. Crowds of critters followed him and I had to clear them out lest have them get in the way, or worse, cause me unnecessary damage. It was quite clear early on that my meager nippings at his ankles would not be enough to halt the behemoth, but the game indicated there were weapons I could use that might be more effective. Placed on walls in certain areas were cannons that I could run up to and control. By aiming for Gigantis' single eye, I could deal over a thousand hit points of damage in a single shot where I was shaving off double-digits with my sword. Each cannon could fire 3 shots before they would be unusable for about 30 seconds while they recharged. These stage gimmicks made the game far more engaging and I found myself desperately slashing away at Gigantis' feet, trying to slow his pace, before running to the nearest cannon to fire off 3 rounds and then repeating the process. I'm curious to see what other sort of creative boss battles the full game will have in store. One thing I noticed during my battle was that one of my party members leveled up during the skirmish. I didn't get to see a battle result screen so I'm not sure how level progression works in the game, but I am curious. The latest trailer also shows the various different characters in the game. My party consisted of the obvious main hero, the female fighter, the whip-wielding girl, and the barbarian character, but so far the full game is looking to offer a roster of twelve characters. The game also looks to offer a dramatic story mode as seen from the trailer above. I managed to take Gigantis down with only 30 seconds to spare before the demo ended, and apparently I was in a minority. The staff actually had a counter to show how many people had managed to beat the boss, which, when I left, was only about 37 out the hundreds who had played the demo. According to the official Dragon Quest Heroes twitter account, by the end of the 2-day event, the total number was 303. It was pretty hard, and quite a satisfying experience in the end. I think I can count on one hand the number of games where playing a demo convinced me to want to get the full game, and Dragon Quest Heroes is one of them. The demo completely subverted my expectations and now I am totally looking forward to it. 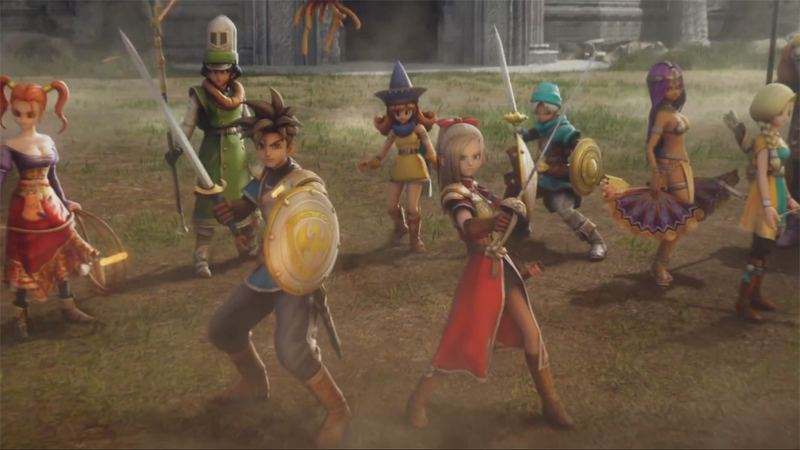 Dragon Quest Heroes is scheduled for release on the PS3 and PS4 in Japan on February 26th. No word on a Western release.